Extremum's interface looks like a menu from a 23rd-century restaurant for robots. A new year it might be, but Sinevibes is sticking to its distinctive-looking AU-only effects processor blueprint with Extremum, which is designed to turn even simple sounds into "tonally rich new material". Helping you to do this are a 256-stage phaser, a 24-stage chorus, a 16-stage positive/negative comb filter, and an 8-stage positive/negative barber-pole phaser. 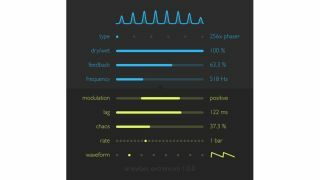 There's also a modulation generator with eight waveforms, adjustable lag and periodic chaos. Find out more on the Sinevibes website, where a demo is available for download. Extremum costs $29.